Larry Miller is a very successful car dealer from Salt Lake City. 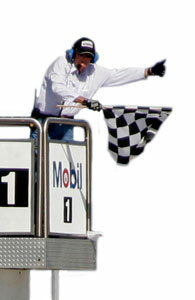 This year he completed his dream of a racetrack in the Utah desert, appropriately named Miller Motorsports Park. The facility is second to none. The racetrack was designed by Alan Wilson, who is now its General Manager. Absolutely first class! HSR sanctioned this event, billed as ‘East meets West’, with roughly half the entries coming from HSR-West. We had thought vintage racing was more competitive in the East. Rarely do the two groups meet, and this time it was going to be on ‘neutral ground’, as the track was so new, nobody could have logged track time there before this race. Wrong! The actual East vs. West thing turned out to be close, with the East winning by a whisker. We lived with the track map. Every minute sitting on the false grid was study time! The track is 4.5 miles, so it’s longer than Road America, but the straight is shorter. There are 24 turns, and the landscaping is basic desert, so it’s easy to get lost as to where you are. Until you ‘get it’, several turns look exactly the same on entry, but are way different on exit! 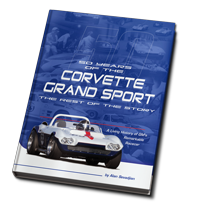 In HSR the Duntov Corvette Grand Sport runs with the big car field. That means Corvettes, Camaros, Mustangs, and Cobras (both big block and small block), among others. In this case ‘among others’ included two Ford GT’s, one a seven liter J model. The entry turn out was disappointing for the event, but for our class it was outstanding! Miller Motorsports Park added an all Ford race to the normal HSR venue, and billed it as the ‘Feature Race’. A Ford parade! Ford racecars came out of the woodwork for this one, and they apparently expected to mop up in the Group Five race while they were at it. They didn’t. We won the race and set the fastest lap on the last lap; a 3:10.2 (on treaded tires, of course). The fastest race lap of the highest finishing Corvette at this year’s Labor Day Rolex Grand American race was a 3:02.2. Had we been able to run the big wheels and low profile slicks of the Grand Am GT cars, imagine the lap time we would turn! We passed for the lead on the last lap. Second was a Ford GT; third a 427 Cobra. We used the entire race weekend to test and tweak the handling, and just in time for our feature race, we got the handling really dialed in. Only then were we finally able to put Zora Duntov’s favorite car back where it belongs – in front of those pesky Fords! If it weren’t enough to beat the Fords and win the Mark Donahue trophy, at the Sunday night banquet we won the Workers Favorite award; a checkered flag signed by all the corner workers. What an honor, and what a great weekend! Miller Motorsports Park, 'East Meets West', first and second place finishers!